Am I An Engineer? : What Engineers could learn from the movie "Titanic"
What Engineers could learn from the movie "Titanic"
A couple of days ago, I went to see Titanic 3D. This is my second, or maybe third time seeing the movie since 1997/1998 (it’s true, I swear! I know some of you saw it 10 times back then, don’t lie to me ;P). Back then when I was a teenage girl, Titanic did not left any impact on me from the engineering point of view, all I saw was the tormenting love story between star-crossed young lovers, Jack and Rose. Of course, I was like any other teenage girl back then, all doe-eyed for Leonardo DiCaprio. Image from IMDb also includes reviews. Alright, this post is not actually about all the gushy-mushy gooey dooey loveyy storeyyy or how cute Leo is, but rather it is about the engineering lessons we could all learn from Titanic (3D or 2D, likewise). WARNING: Titanic 3D film spoilers ahead. Do avoid reading if you have not watched the movie yet. Always take serious all warning signs. 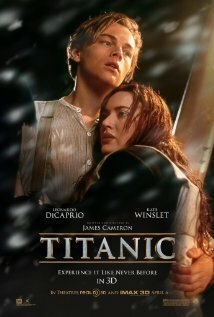 In the movie, we see the crew received warning memos (or telegraphs) of icebergs floating in the Atlantic ocean that poses danger to the ship, however all the warnings went unheeded by the Captain (although he did looked quite concerned about it) and the ship’s company Director, Mr Ismay because he believes The Titanic is ‘unsinkable’. As an engineer, we should take serious all warning signs and red flags that popped up, even if we don’t see the problem occurring as yet. We should know that prevention is better than cure; designing for reliability is better than designing something ‘just to make it/meet the date’ and do the fire-fighting later if it occurs. It takes a lot of practice, knowledge, experience and wisdom to have foresight of the impending problems, which is why it is important to talk to experienced engineers. Mr Ismay persuaded the Captain to blast the ship full speed ahead so that the Titanic would arrive to New Year earlier than expected and make massive headlines in newspapers, both in the States and Britain. Despite the knowledge that full speed might damage the boilers, Captain EJ Smith still followed instructions. The law of Inertia will not bend, a ship moving at high speed will not have time to swerve away just in time from an iceberg at such a short distance. We all know it is great to make headlines and break records, but as a person with more technical knowledge than the rest, one should inform with great seriousness of the concerns and grave dangers of such actions (if there are any) the higher management. Safety always comes first. Everyone who boarded the Titanic and even the owners boasted that RMS Titanic is UNSINKABLE. We all know what happened right? By saying something like that, it has created a ‘false truth’ to everyone that it is unsinkable and when warning alarms were sounded, everyone did not took it seriously at first and thought it was just a ‘drill exercise’. I think that all designs; there won’t be anything that doesn’t have any technical weaknesses. There will always be some limit that restricts the operations of your machine/circuit/contraption/etc. Work and stay within the limit, but for something to be great, you must try to push the limits to see what are the areas for improvements so that the next one would be even better. After the iceberg had hit the Titanic, we saw Mr Andrews, the builder of the ship running to the Captain’s room with his blueprints. It seems that he had designed Titanic with cutting-edge hull design that could withstand flooding if 2 of the compartments were filled with water, but unfortunately 5 compartments were already filled with water and it was too late. Titanic is headed towards tragedy in less than 2 hours. From this perspective, it was really innovative of Mr Andrews with the hull design. One trait that an engineer must have, innovative. Can’t comment much on this because maybe at that time, 2 hulls with 16 water tight compartment seems full proof enough to be ‘unsinkable’. The question is “To what extent does one has to design to account for the worst?”, this is an engineering judgement that we all must decide upon. Over engineering might increase the cost, being too confident with one’s minimalist design is taking a risk too far. In the movie, we saw Mr Andrews taking a group of first class Gentlemen and Ladies on a tour around the ship. Rose mentioned about the number of lifeboats that were too little compared to the number of people aboard the ship. Mr Andrews was very aware of this, but he said because the liner’s management wanted more space for the decks some of the lifeboats had to be taken out. And in one of the scenes while the Titanic was slowly sinking, we saw Mr Andrews scolded one of the first class passenger for not wearing a life jacket because it didn’t suit her gown. You’ll be lucky if that black icy Atlantic water matches your gown later, lady. Hearing that is already a red flag! Should I explain more? I will never forget how the string quartets kept playing their instruments with sooth sounding music to keep the mood calm and prevent people from panicking. They played right till the very end. The ship’s crew also tried to keep their calm by managing the passengers into lifeboats in orderly fashion (well, they tried). From my experience, in moments of distress and pressure, it may seem that fleeing manically seems like the best thing to do in order to survive, but trust me it is not. When facing problems or issues, the best thing to do is first to calm down, then try to put emotional distress aside. Analytically think about what is the root cause of the problem and try to find a solution for the problem. External environment might not be conducive enough to help you stay calm (who could, with all the shouting and screaming from all levels of operations? Lulz! ), but just try your best. A lot of people died on that fateful night, including Titanic’s Captain, shipbuilder, crews, passengers and last but not least, Jack Dawson. What I can take from this is that, maybe the Captain, Mr Andrews and the crews decided to stay and go down with the sinking ship because they felt that the accident that happened was their mistake and it was their fault that they failed their responsibilities to bring the ship to New York safely. One of the crew after giving salute to his fellow shipmates, shot himself in the head due to the guilt he felt after shooting a panicky passenger that created havoc while evacuating the ship. Some passengers decided to leave behind because if they’re saved that would mean one less seat left for other souls (namely women and children are of priority) on the lifeboat. Most who decided stayed behind were brave men and old people. Jack sacrificed himself in order to save Rose’s life. If he had climbed onto the plank together with Rose, both wouldn't have made it. When something bad happens, it’s always easy to find blame and fault in other people. Maybe that’s our human survival instinct, perhaps, I might be wrong. Finding blame in others is a negative quality to have because it will cause distress and also reduces one’s confidence and image. To be a strong team/unit, we have to bound together and support each other. What could be worse than taking accountability for your mistakes? Be brave and do the right thing. Author's note: All these lessons were solely based on the movie itself and I did not do any extensive research to support any claims (sorry if this has created any injustice historical facts). So, there you go, 7 long winded lessons. I could go on and on, like the theme song itself but maybe stopping here would be for the best. Did I made you want to watch Titanic in 3D or not? And as for the movie review: I would highly recommend you to go and watch Titanic 3D because the visuals and the sounds are even much more better than it was 15 years ago. It felt almost real and you will feel like you're freezing to death in the icy waters of the Atlantic ocean. Even though 3 hours and 20 minutes is such a long time to be wearing bulky and heavy 3D glasses (it almost made a dent on my nose and between the ears! ), it is actually quite practical to hide your swollen eyes and tears. Thank you James Cameron for making me feel like a teenage girl again. PS: Please do not expect Titanic to be anything like Avatar.